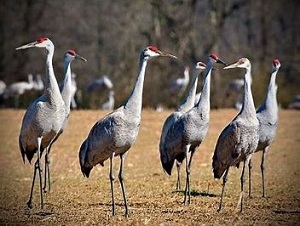 Carpool south 1+ hours to see Sandhill Cranes during this community organized celebration of the Sandhill Crane. Each year 6,000 to 10,000 cranes overwinter in the Hiwassee Wildlife Refuge at the confluence of the Tennessee and Hiwassee Rivers. Parking, lectures, exhibits, and food are offered at the Birchwood Community Center. Free shuttle buses take visitors to the viewing area. Shuttles also stop at the Cherokee Removal Memorial Park where exhibits, demonstrations and historical perspective of Native American Indians can be viewed.